Where can I find more information on insurance reimbursement? Information on reimbursement can be found by using this link. Click here. How to return a tendon? Does JRF Ortho supply aseptic, non-irradiated tendons? 1. “Approximately 65% of all recovered unprocessed tissue is exposed to a low dose (12 to 18 kGy) of gamma irradiation in a frozen state prior to aseptic processing. The Musculoskeletal Transplant Foundation utilizes this low-dose irradiation pretreatment step to decontaminate tissue prior to aseptic processing.” Greenberg, D. D., et al. Allograft Compared with Autograft Infection Rates in Primary Anterior Cruciate Ligament Reconstruction. The Journal of Bone and Joint Surgery 92.14 (2010): 2402-408. What is the cleansing and lipid removal process for aseptic tendons? 2. Gardner EM, VonderHeide N, Fisher R, Brooker G, Yates PJ.. Effect of hydrogen peroxide on human tendon allograft. Cell Tissue Bank. 2013 Dec;14(4):667-71. doi: 10.1007/s10561-013-9377-x. Epub 2013 May 18. How do the cultures work for aseptic tendons? Each tissue has two cultures; including a highly sensitive final fluid extraction culture3 which must be negative for any growth. 3. Dennis, J et al. A comparison of two microbial detection methods used in aseptic processing of musculoskeletal allograft tissues. Cell Tissue Bank (2011) 12:45-50. How do you know if you are getting irradiated or aseptic tissue from JRF Ortho? Unlike other companies, JRF Ortho is fully transparent on the use of irradiation providing different part codes to clearly distinguish between aseptic & sterile tendons. Pathways is an organization that allows you, the recipient, to acknowledge that you have been positively affected from a donor family’s gift of donation. I received an allograft. How do I get in touch with the donor family? After the surgery, you should have received a card with the graft ID number. You can go to the Pathways website, 1000thanks.org, to send a letter of thanks to the donor family using that ID number. However, it is ultimately up to the donor family on whether they would like to connect with the recipient. Aseptic technique is a practice that prevents, restricts or minimizes contamination from any potential sources of harmful bacteria, viruses or other microorganisms. Tissue is processed and packaged under these guidelines to prevent any introduction of contaminants from initial donor procurement through transplant. Cryopreservation is the process where tissue is preserved by cooling it to low subzero temperatures. The tissue is subjected to a cryoprotectant, such as glycerol or dimethyl sulfoxide, to reduce ice formation on the tissue during the freezing process to -80°C. Proximal and distal long bones are examples of cryopreserved grafts. What is a frozen graft? A frozen graft is aseptically processed and packaged within a clean room environment. Examples of frozen tissue are tendons and they are stored at a temperature of -40°C or colder. What is a fresh frozen graft? Fresh frozen grafts are minimally processed just like fresh grafts, but are stored in the freezer and have a shelf life of 5 years. Meniscal allografts are a good example of a fresh frozen graft. What is a fresh graft? A fresh graft is aseptically processed within 48 hours of donor procurement. It has a strict time frame before the graft expires of 28 days. These minimally processed grafts are packaged within an essential media to maintain cell viability and stored in a refrigerator until transplant. What is load to failure? Load to failure is the amount of weight and pressure that a particular area can sustain before it no longer functions. From the failure point on, the area in question has lost its strength, may be damaged and will not operate appropriately. Sterility is defined as the absence of all living mircroorganisms. Tissue is processed under aseptic conditions using sterilized equipment. This means that all practices are utilized in order to prevent, restrict or minimize the possibility of contamination to the tissue from microorganisms. Donated tissue is not classifed as sterile, but combined with irradiation a Sterility Assurance Level of 10-6 (1:1,000,000) can be obtained. Viability is the proficiency of tissue and its packaging method to sustain existing living cells that will carry out their essential functions once the tissue has been transplanted. A proteoglycan is a protein that is attached to a carbohydrate and is a major component in forming the extracellular matrix of connective tissues. Since joints are supposed to provide a smooth and lubricated surface so that bones can handle loads, retaining water within the extracellular matrix between joints is important to retain the function and structure of the area. A chondrocyte is a mature cell type found in articular cartilage, which is essential for the cartilage to form and function properly. Under normal circumstances, chondrocytes can handle the normal wear that cartilage will go through over time. In some cases, cartilage can become so damaged that it cannot repair itself. In this instance, transplants are available to replace the cartilage after a severe injury or defect. OCA stands for an Osteochondral Allograft. These are tissue grafts that are composed of bone and viable cartilage cells. 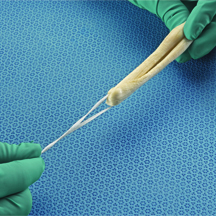 Articular cartilage lacks the ability to heal itself, so these grafts are used to address cartilage defects and injuries in patients. Osteochronditis dissecans (aka “OCD”) is a condition in which the bone that supports the cartilage inside a joint undergoes softening. This softening is caused by an interruption in the blood flow to that portion of bone. Over time, if left untreated, this can lead to damage to the overlying cartilage of the joint. An allograft is tissue that is surgically transplanted from a deceased donor. Approximately one million allografts are transplanted each year in the United States. Examples of procedures using allografts: ACL repair, joint reconstruction in the knee and ankle, meniscal replacement, shoulder repair.